The Burgon and Ball Classic Topiary Shears are made from the finest steel from Sheffield, England. The secret of the shear's sharpness and longevity lies in the unique hinges patent double hollow-ground blades. 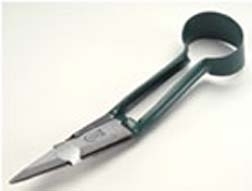 These shears are perfect for dead-heading, grass clipping, foliage trimming, and shaping topiaries. 12 3/4" overall, 5 1/2" blades. To sharpen, use the Burgon and Ball Shear Sharpener. 2 x Bachi Gata Hoe 15"
1 x Handy Scoop Pink 11"
1 x Handy Scoop Purple 11"
Notify me of updates to Burgon and Ball Classic Shears 12 3/4"